Patricia Cowan, Ph.D., R.N., dean of the College of Nursing is invested in the Linda C. Hodges Dean's Chair by UAMS Chancellor Dan Rahn (left), M.D., and UAMS Provost Stephanie Gardner (right), Pharm.D. Aug. 9, 2016 | Aug. 9, 2016 | Patricia A. Cowan, Ph.D. R.N., dean of the University of Arkansas for Medical Sciences (UAMS) College of Nursing, was invested Aug. 4 in the Linda C. Hodges Dean’s Chair. Cowan succeeds Lorraine Frazier, who left UAMS last year, as both the chair and dean. Cowan began at UAMS on Nov. 9, 2015. She came from the University of Tennessee Health Science Center in Memphis where she served as professor and associate dean for academic and student affairs in the College of Nursing. 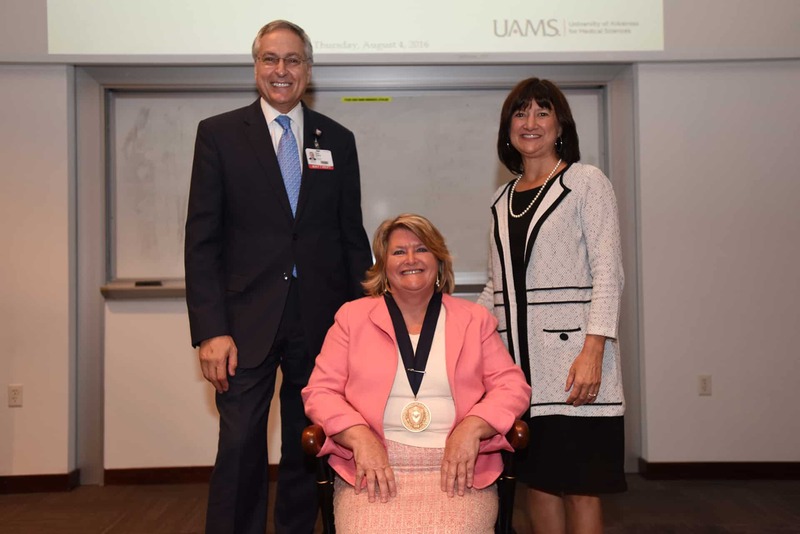 UAMS Chancellor Dan Rahn, M.D., and UAMS Provost Stephanie Gardner, Pharm.D., Ed.D., presented Cowan with the chair medallion. Jean C. McSweeney, Ph.D., associate dean for research in the College of Nursing, speaks at Cowan’s investiture. 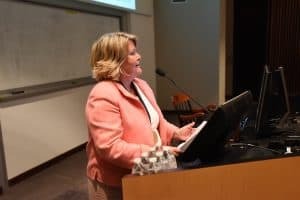 Jean C. McSweeney, Ph.D., the college’s associate dean for research, said she felt certain UAMS would remain a leader in nursing education under Cowan’s leadership. “Dr. Cowan has a vision for our college and is dedicated to meeting the needs of our students, hiring the most qualified faculty and retaining our excellent faculty and staff,” said McSweeney. 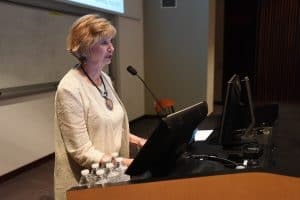 Donna K. Hathaway, Ph.D., R.N., Cowan’s mentor and a distinguished professor at the University of Tennessee Health Science Center, said her underlying passion for teaching and preparing the next generation of nurses would serve UAMS well. Cowan earned her Bachelor of Science in Nursing at the University of Missouri and her Master of Science in Nursing at the University of Kansas. She earned a doctorate in nursing science at the University of Tennessee. She has more than 30 years of experience in all areas of nursing including academics, clinical practice and research. Her research interests include lifestyle interventions in overweight youth and adults and cardiovascular and metabolic outcomes. She participates in a multi-professional research team and is interested in translational research. Cowan is a member of the American Heart Association, American Nurses Association, Southern Nursing Research Society and Sigma Theta Tau International. Cowan highlighted Linda Hodges’ impact on the College of Nursing and said she hopes to inspire others as Dr. Hodges has. Linda C. Hodges, Ed.D., R.N., served as dean and professor of the College of Nursing from 1989 to 2006. During her tenure, the college greatly expanded its academic programs to include the state’s first online higher education academic degree program, numerous master’s specialty tracks, including the first nurse practitioner program in Arkansas, and the state’s only Ph.D. in nursing program. In 2000, Daphine D. Doster, a pioneer in nursing education in Arkansas who was active in establishing the state’s first nursing school, bequeathed funds to establish a professorship to recognize Hodges’ leadership in the College of Nursing. It was later elevated to an endowed chair.